Get your hot water for less. You can get hot water – without a tank! An innovative solution for modern households, propane-fired tankless water heaters provide on-demand hot water, take up much less space and are more energy efficient than your traditional tank. To top it off, it works with both your running water and any sort of water-based home heating system. Our sales team works hard to source the best brands in the market, making sure we have the most efficient and state-of-the-art tankless water heaters to meet your unique needs. 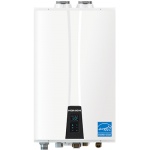 One example of a leading propane-fired tankless water heater we offer is the Navien NPE Series. We’d be happy to talk to you about this product and the other tankless water heater brands we carry anytime. If you have questions, just give us a call at 1-877-635-3645 or complete the form below. Reduce CO2 output by 1,216.8 lbs per year compared to traditional tank type heaters. This would be the equivalent to saving 248 litres of gasoline in your car. Ready to talk to a customer service representative? Call us at 1-877-635-3645 or complete the form below and we’ll contact you.